Americans love deli-food. Whether it's picking up a 'ham-on-rye' from your corner sandwich shop or ordering a monster tub of 'slaw from the deli-counter at Costco. If you're planning to buy or set-up a new delicatessen, you can rest assured people will want your food...there are just a few things to consider first. • On average, over 300 million sandwiches are consumed every day in the United States, nearly one for every man, woman, and child living in this country. • Including hamburgers, sandwiches make up over half of all the ready-made food consumed across the country every day. • Of the over $685 billion spent in 2013 on eating out, Americans spent approximately $28 billion on sandwiches. • In reference to limited service restaurants such as delis, 43% of consumers have recently placed an order online, 65% say ease of parking is an important factor in their choosing a place to eat, and 87% say good service is a key attribute for choosing a restaurant. When you're escaping the cubicle for an hour in the middle of the day, or you're stepping out for a quick bite during a cram session for mid-term finals, you generally have two choices: a fast food chain restaurant, or a small independent restaurant. And more often than not, that small independent restaurant is some form of deli: an inexpensive neighborhood food shop specializing in hot and cold sandwiches, soups, salads, snacks and drinks where you can pick up a healthy and filling meal for under $10. The term “deli” or “delicatessen” covers a wide range of styles and sizes of establishment. Some are tiny 1-2 person operations open a few hours a day to serve a very limited clientele. For example, a sandwich shop that leases space on the ground floor of an office building to serve lunch to the 300 employees who work there. 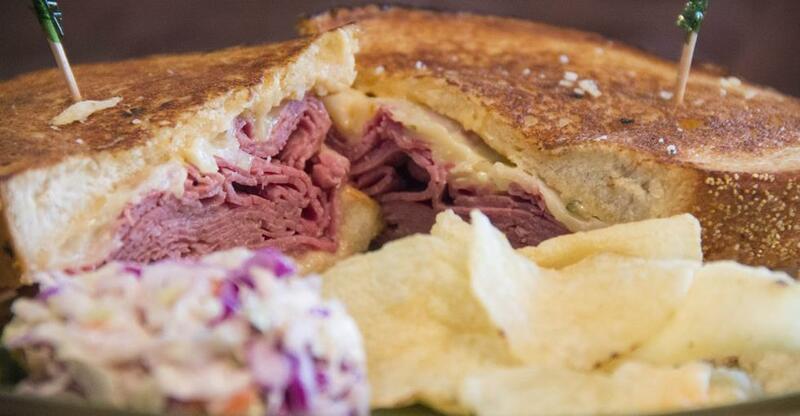 Others are large locations with a full-service deli offering cold cuts and trimmings to take home, or fresh made sandwiches, soups, and salads made to order for dining in or take out. They may be combined with a grill for hamburgers or other hot sandwiches, a bakery for desserts and fresh bread, or even convenient store or grocery items available to customers. In all cases, however, the bottom line basis of a successful deli is consistently good food at a reasonable price, offered conveniently for the target market in the area. If you're considering opening a deli, it's important to look closely at your potential locations and what competition you'll face in the immediate vicinity. A deli derives most of its daily revenue from the lunch rush, and the bulk of the customers that come in during that time are going to be in a hurry. They're unlikely to travel very far to get to your location. So, it's important that your deli is set up in a place where many people work within easy walking or very short driving distance. It's also important that your location, menu, decor, prices, or something else about your deli sparks interest and differentiates you from already-established competition such as the McDonald's or Burger King down the street, or the cafes that have sprouted up in the local Target or supermarket. In addition to other deli-style restaurants and fast food chains in the area, you are also competing to some extent with bag lunches. In other words, you will need to keep your selections interesting and your prices reasonable enough to be worth the far higher cost of eating out instead of bringing a lunch to work. Startup capital requirements are dependent on a number of variables and the range is very wide. To lease a small space inside a building or commercial center that is already zoned and equipped for food service use, and use that spot several hours a day to serve cold sandwiches to order, will likely require very little initial outlay of funds or labor costs. On the other hand, building a brand new restaurant from scratch will require hundreds of thousands of dollars in construction, equipment, and marketing for it to succeed. In all cases, it's important to research local licensing and health inspection requirements for food service businesses in the area you choose to locate your deli. In many cases at least one person working at the deli will need to be certified by the state or county health inspection department as well. Without a doubt, word-of-mouth still remains the very best marketing available to small businesses like delis. A satisfied customer is likely to tell his or her friends about the place he went to eat, and they're more likely to follow their friend's recommendation than to seek your deli out based on a coupon in the local paper. But there are plenty of marketing tactics that can encourage and complement word-of-mouth advertising. For instance, quality signage and a memorable name and/or logo can make it far easier for customers to find you and remember you. Expanding the logo branding onto to-go containers, cups, napkins, and other items customers will take with them also improves your chances of drawing friends and family in. Social media and mobile marketing efforts can be effective if used wisely and handled respectfully, but they will require a considerable amount of time, so they may not be the best option if you are opening a small operation with few employees. Offering complementary services such as delivery, event catering, or large order discounts can also help encourage recommendations. Even a predetermined and adequately marketed list of daily specials can expand your customer base and loyalty as people find their favorite sandwich and come back weekly to get it at a great price. In many cases, the best way to successfully introduce a new deli is to start simple with a great idea and a few signature dishes that people love. Then, as your customer base expands through the methods noted above, you can consider expanding your menu and your list of complementary services to grow the business. By starting slow and simple, you can expect to be profitable sooner and in a better position financially to expand without egregious risk.